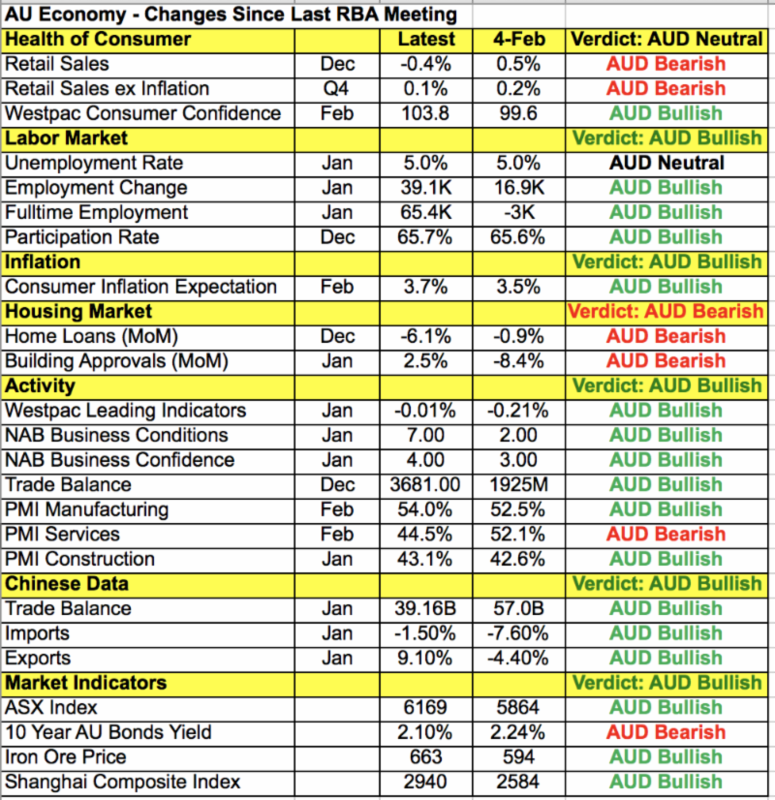 Home Markets FOREX Will the RBA Drive AUD Below 70 Cents? The US dollar gapped lower at the start of the Asia session after President Trump complained about the strong dollar. However the greenback recovered its losses quickly because US Presidents don’t yield much influence on the value of the currency. This is a very an important week for currencies and the dollar in particular but the Fed’s Beige Book could highlight the labor market’s strength and the benefits that it may be having on the economy. Friday’s non-farm payrolls report should show job growth slowing from the previous month’s spectacular rise but if job growth exceeds 180K and wages rise, investors could see the data as dollar positive rather than negative. Non-manufacturing ISM is due for release tomorrow and as a leading indicator for NFP, the report could have a meaningful impact on the currency. More importantly, central bank rate decisions and economic reports from other countries will make relative growth a bigger driver of FX flows. The action kicks off with tonight’s Reserve Bank of Australia monetary policy announcement. AUD and NZD are up on talk that all of the tariffs on China will be lifted if a trade deal is reached. Australian data was also better than expected with building approvals and the PMI services report rebounding in February. AUD/USD, which fell sharply last week is stabilizing ahead of the rate decision on the hope that for once, there could be a tinge of optimism from the central bank. The last time the RBA met, Governor Lowe sent AUD/USD tumbling lower by lowering their growth and inflation forecast, highlighting the risks abroad, expressing concerns about housing market consumption and describing the interest rate outlook as more evenly balanced. These comments led investors to rule out a 2019 rate hike and left the RBA with a dovish slant. So while the following table which compares data changes from the last meeting show an economy that is starting to improve, we believe that the RBA will remain cautious. Behind the scenes, they’ll be happy that the March 1st deadline passed with no additional tariffs on China but before a deal is signed, their economic assumptions won’t be changed. With a rate hike off the table for this year, the path of least resistance for AUD/USD is lower but the pair could rebound if they vocalize their optimism. Meanwhile Tuesday’s dairy auction is not expected to have a significant impact on NZD which should move in lockstep with AUD. UK PMIs are also scheduled for release and sterling is trading lower ahead of the report. Last week’s manufacturing PMI numbers showed the sector slowing for the second month in a row and we expect this same weakness in services. Brexit uncertainty has taken a big toll on investment and activity. Traders should also keep an eye on Brexit headlines ahead of next week’s vote. With less than a month to go before the UK leaves the European Union, investors are getting more nervous than ever. Theresa May’s ongoing negotiations with the EU and other parties in the government have yielded very little. She’s promised another meaningful vote in Parliament on March 12 and she’s likely to concede to an extension of Article 50, which would delay Brexit. There’s already been talk of a 2 year extension in Brussels. Last week, the Trump Administration gave the UK a taste of the trade agreements they can expect when they leave the European Union. They want barriers on US exports to be removed, particularly on agricultural goods and warned that they could take “appropriate action” if they negotiate a trade deal with a “non-market country,” like China. This will certainly be problematic for the UK as it shows the challenges of negotiating from their weakened stance. GBP/USD has fallen and we think the slide could extend to 1.3050. Stronger than expected producer prices also failed to help EUR/USD, which dropped below 1.1350. The ECB meets this week and the possibility of another TLTRO should cap the gains in the currency. Next articleWill The Markets Decline Turn Into Something Steeper? Probably Not!